38% of public relations practitioners’ total skills could be complemented or replaced by AI within five years warns report but human skills remain in demand. Schumpeter’s gales of creative destruction caused by technology is so pervasive using the term ‘disruption’ has become trite. Technology, including Artificial intelligence (AI), is revolutionising every industry, from finance to farming. Public relations is not immune. The CIPR's Artificial Intelligence (AI) panel has today published new research revealing the impact of technology, and specifically AI, on public relations practice. It predicts the impact on skills in the profession in the next five years. Technology begets technology increasing the rate of change exponentially. The CIPR #AIinPR panel has addressed the question of skills within public relations. It wanted to know how much AI was already in public relations and how fast it is evolving. 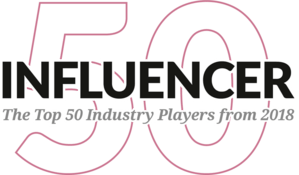 To benchmark this the panel reached out to dozens of PR professionals who helped provide a snapshot of how technology is being used within our industry. More than one-in-three (38%) of public relations practitioners’ total skills (out of 52 skills) could be complemented or replaced by artificial intelligence within five years warns the report. 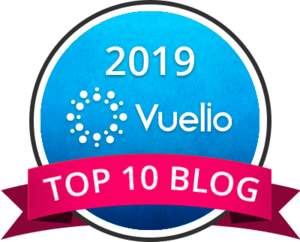 Skills associated with conducting basic research, creating content, evaluating campaigns, tracking issues and countless work processes are being automated or already have some AI. In five years, these types of tasks could become either fully automated or have a high degree of AI applied. The sophistication within these tools will only increase. 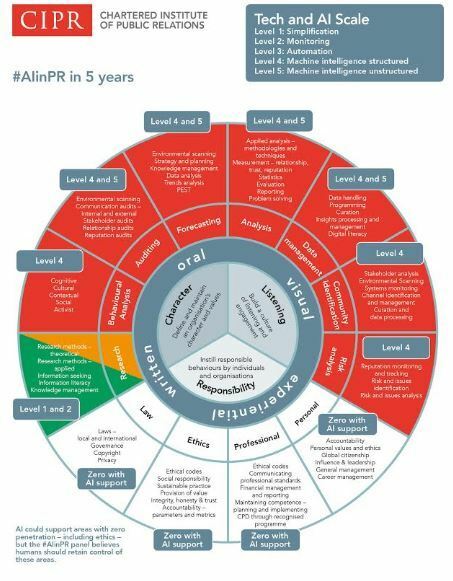 The #AIinPR in 5 years wheel can be accessed as a high resolution image here. “Current discourse [about the impact of technology on public relations] is polarized between techno panic and denial. Neither is helpful.” comments Stephen Waddington Chair, CIPR #AIinPR panel in the foreword to the discussion paper, Humans still needed: An analysis of skills and tools in public relations. Skilled use of technology scales the impact of progressive public relations practitioners. It enhances our work; it doesn’t replace it. The extent to which technology or AI will expand will never fully replace public relations professionals but will increasingly assist us and possibly do a better job. Of the 52 skills measured by the #AIinPR panel, 17 (32%) were deemed to currently have zero tech support. Given the high human aspects associated with judgement, interpretation and experience, we don’t see the ‘zero list’ changing much in future. Fundamental human traits such as empathy, trust, humour and relationship building can’t presently be automated. 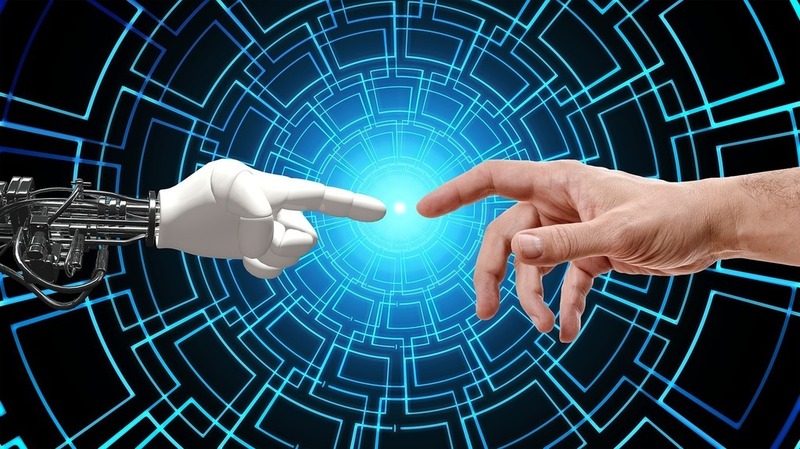 Skills such as: flexibility with constant changes, mentoring, familiarity with theories and its application, strategic thinking and ethical considerations are unlikely to be overtaken by AI. There might be tools that inform our decisions now and, in the future, but predominantly, these will remain the domain of humans. Technology is impacting practice in other areas of practice including the simplification of tasks; listening and monitoring; and automation. Therefore, another 27% of the practitioner’s skill set benefits from the support of some technology to assist in decision making or deep analysis. In five years, there may be more assistance from AI tools which will contribute more directly to the application of skills in this category but on balance human intervention is dominant. “Human intervention, editing, sensitivity, emotional intelligence, applying good judgement and ethics will always be needed”, explains Jean Valin Hon FCIPR who led the CIPR's Artificial Intelligence (AI) panel.